An entity that looks just like Sora's friend Riku. He is, however, not the real deal. Data-Riku was chosen as a sort of ark to keep all the collective data within Jiminy's journal safe from bugs; in a way, he IS the journal now. But even he could not explain the cause of the bugs, so, after adopting Riku's appearance, he "imported" Mickey and friends to help solve the mystery. "Memories used to fill Jiminy's journal. But when they were pulled apart and stitched back together, Bugs appeared. The full set of memories was transferred into me, to shield them from corruption. Of all the possible vessels, I was chosen from the journal's pages. So, in a way, what I really am is Jiminy's journal." Data-Riku is a character that appears in Kingdom Hearts coded. He is the digital counterpart of Riku, formed from the data contained in the digitized Jiminy's Journal, as well as a vessel for the memories contained within the journal. Data-Riku had bound the memories contained within Jiminy's Journal together when they were strewn apart, but this restoration could not be completed because of the Bug Blox infestation. Of all the memories inside the Journal, he was selected to be a vessel to hold the memories together and protect them from corruption. He even involved King Mickey, Donald, Goofy, and the Data-Sora in this process to solve the mystery of the strange words that continued to appear in Jiminy's Journal by transferring Disney Castle to the Datascape. Data-Riku continues to aid the protagonists throughout the story, but he is eventually captured by Maleficent and Pete, the latter using bugs to force Data-Riku to fight Data-Sora. Data-Sora is then tasked with debugging Data-Riku's data. Data-Riku first appears before King Mickey, Donald, Goofy, and Data-Sora. Data-Riku was selected by Naminé to keep the untainted memories of the first journey from being corrupted by the "hurt" she added to the journal. Data-Sora encounters a black-coated figure on the digital Destiny Islands, who gives him cryptic clues and leads him to a Keyhole. At that moment, Data-Riku decided that reinforcements would likely be needed to debug the Datascape, so he used the connection to the real world to bring Mickey, Donald and Goofy inside; however, he kept this from them as he needed to have Sora get stronger alone first. Data-Riku reappears in the data versions of Traverse Town and Wonderland, giving more cryptic messages and occasionally lending Data-Sora assistance as he works to destroy the bugs and corruption in the worlds' data. Each time a world in the journal was fixed, Data-Riku was able to access the data deeper; each time a vision appeared in his mind and found its way back to the monitor Mickey and the others were watching. Believing Data-Sora had developed a more open mind to the impossible, Data-Riku decided to it was time to reveal the truth about their existence. Data-Riku opened a corridor of darkness to lead him to the Datascape version of Disney Castle. Jiminy's Journal taking the form of fifteen-year-old Riku. Data-Riku appeared before them and revealed that he was not the real Riku, just like how Data-Sora was not the real Sora. After giving them the long-winded version of what he is, Data-Riku simplifies his existence as the personification of the journal itself. He revealed that he brought them all into the Datascape to uncover the mysterious message that appeared in the journal. However, before they could discuss this further, a someone broke into the Datascape from the outside and severed the connection to the real world, leaving Mickey, Donald, and Goofy trapped until the bugs are completely removed. As Data-Sora continues visiting the worlds in the journal, Data-Riku stays in Disney Castle, guiding Sora through the monitor. When Data-Sora reaches the digital Olympus Coliseum, Riku tells him that the reason he did not reveal himself to Sora earlier is because he wanted Sora to become stronger. He discusses with Sora whether they are data or artificial, and Riku says that it does not matter as long as they can make an impact to the world and help their friends. They discover the intruder is none other than Pete (as the journal has no record of Pete, there cannot be a copy of him in the Datascape). As Pete is not bright enough to act on his own, Data-Riku suspects the real Maleficent is not too far behind. When Maleficent destroys Data-Sora's Keyblade in Agrabah, Data-Riku and Mickey come to help. However, Maleficent and Pete capture Riku and take him to Hollow Bastion, where they infect him with bugs, unaware that this could destroy the Datascape as all the data was inside Data-Riku. Later, when Data-Sora defeats Pete in Hollow Bastion, he summons the bug-controlled Data-Riku to fight Sora. After Sora defeats Riku, Riku collapses, with Bug Blox fused with his body. Mickey arrives and tells Sora that unless all the bugs in his body are destroyed, Data-Riku will never wake up. After his battle with Data-Sora in Hollow Bastion, Data-Riku becomes consumed by Bug Blox. Data-Sora uses his Keyblade to enter Data-Riku's data, meeting with Riku's consciousness. Riku leads Sora through his memories to destroy the bugs and to recover his own power. After Sora destroys the source of the bugs, a corrupted version of Riku himself, Maleficent tries to interfere with Data-Riku's recovery. Data-Sora defeats Maleficent, and Riku awakens. As the data in the journal finishes debugging and collecting, it begins resetting the Data World to its original form. However, Sora's Heartless interferes, and the world begins deleting itself. Riku tells Sora about the nature of his Heartless and rescues Pete and Maleficent. After Data-Sora defeats his Heartless, the Data World is reset. However, as the vessel of memories contained in the Journal, Data-Riku was spared from having his memory erased. With the Journal back in order, he finds the data from Castle Oblivion that had been left behind by Naminé in the form of Data-Naminé and Data-Roxas, and promptly informs Mickey. As Data-Sora lacks the memories of the recent events, Data-Riku allows Mickey back inside the Datascape to serve as his guide. Data-Riku makes one more appearance, in the first White Room in Castle Oblivion. He shows Data-Sora a memory of the real Riku with Kairi on the Clock Tower during the time Riku was lost in darkness, and Kairi had lost her heart. Data-Riku tells Sora that he managed to save them, and encourages Sora to push forward, even if he finds himself in torment. However, all his words were soon forgotten, as part of Data-Roxas and Data-Naminé's plan to teach Sora how to deal with pain. Data-Riku takes on the form of Riku's 15 year-old body as it appeared in Kingdom Hearts and Kingdom Hearts Chain of Memories. He usually wears the black coat of Organization XIII, but when bugged, he instead wears Riku's Dark Mode bodysuit. The bugged version of Data-Riku is completely black version of him in his Dark Mode, resembling a silhouette, and wields a dark versions of Soul Eater. Data-Riku's body and Soul Eater are covered in and surrounded by bugged browser windows, which vary in color depending on what form of bugs currently make up this Data-Riku. Data-Riku also acts in a fairly similar manner to his real-world counterpart. He is shown to care greatly for Data-Sora, even wanting him to become stronger as well. Data-Riku is calm and cool, much like the real Riku was in Kingdom Hearts. When under the influence of the Bug Blox, Data-Riku's personality greatly changes to give him a more aggressive persona. The only major difference between Data-Riku and the real Riku's personalities would be Data-Riku's sense of responsibility. This is demonstrated by Data-Riku's wish to solve the mystery of the strange messages appearing in Jiminy's Journal and also to keep the memories contained within him safe from corruption. One of the many similarities between Data-Riku and the real Riku is the arsenal of abilities they can use in battle. Data-Riku can not only use Dark Shield and counter if the barrier he places before himself is hit (something Riku demonstrated during the battle with Roxas in Kingdom Hearts 358/2 Days), but he can also use the deadly Dark Aura ability (something Riku has demonstrated in all appearances). Data-Riku is also capable of vanishing temporarily and striking the ground soon after, causing several Bug Blox to spawn. Lastly, Data-Riku is able to wield a data version of the Soul Eater, a weapon used in the real world by Riku. As the vessel of the memories of Jiminy's Journal, he also has the ability to manipulate data. He has the ability to access the journal's memories, with it becoming easier as the bugs are destroyed. He also is the one who brings Mickey, Donald, and Goofy into the Data World, and he opens the passage for them to return to the real world. He can partition his data to protect his consciousness and memories from corruption or deletion, and he creates passages for Data-Sora to enter his memories and to leave his data. Unless there is interference, he can also lock down the data in the journal in case of emergencies. Data-Riku is fought in two multi-phase battles. The first battle takes place in the Data Hollow Bastion. The second battle takes place within Data-Riku himself. While he only uses simple slashes and Dark Shields in the first phase of both battles, he gets more aggressive in later phases, using the same agility and abilities as the real Riku. 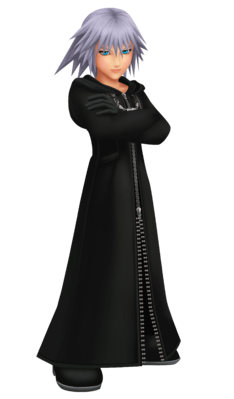 Data-Riku is the first character affiliated with the song Organization XIII (which plays when Data-Riku first enters Disney Castle) to not be a member of the Organization itself. He is also the first character to share another's main theme, since the song Riku plays during the battles with Data-Riku. This page was last edited on 12 December 2018, at 02:21.